Luke’s Way of Looking is a visual feast for children. It tells the story of Luke, a young boy who sees the world very differently from other boys in his class. Every Friday afternoon, his art teacher Mr Barraclough becomes angry with Luke for making pictures that do not conform to his expectations. For example, when asked to draw an apple, Luke makes his bright blue, not red or green. When asked to paint what they saw out of the window, Luke uses unconventional colors and shapes, and his painting makes the roofs bright red, windows are bright green, and straight lines are converted into twisting curves. Mr Barraclough goes ballistic, and shouts at Luke, “What’s wrong with you, boy?” But one day Luke visits an art museum, and sees modern art, and he is ecstatic to find that there are other artists who see the world in similar ways to himself. Luke suddenly sees that his abnormality is in fact a legitimate way of looking, and his artwork is highly creative. Luke takes great pleasure in this art and feels much more confident about his own art. In short, his is a creative and unusual way of seeing and it is the people who can’t see the value in his work who have the problem. Matt Ottley’s wonderful illustrations being Luke’s worldview vividly to life. 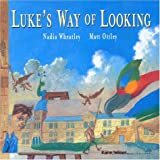 Luke’s Way of Looking should appeal to artistic children, but should also communicate a helpful lesson about seeing the value in other people’s difference to other children too.